The Iontas Building, designed by Scott Tallon Walker, acts as a hub for the campus in general. 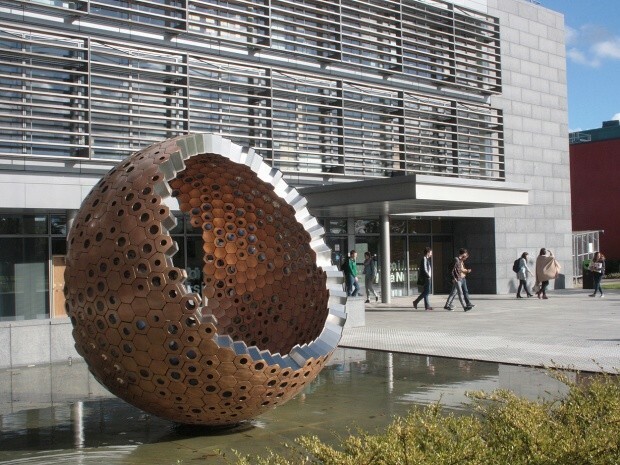 The activities in the building include the NCG engaged in Geo-computational Data mapping and the Foras feasa project which includes the digital archiving of Historic Irish culture. 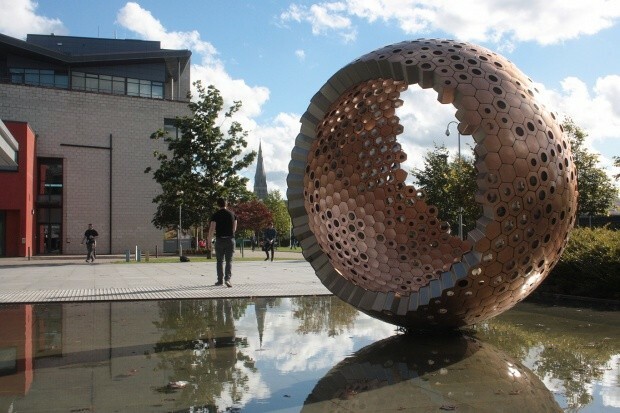 The Sculpture references these activities and aims to embody the creativity, intellectual endeavour and commonality behind the activity of the university through the geometry, complexity and ecology associated with the beehive. 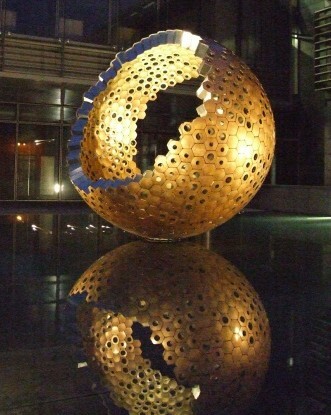 The 3 meter diameter sculpture entitled ‘Waggle Dance’, is made from curved plate bronze perforated by various size holes revealing an internal stainless steel, cellular substructure. 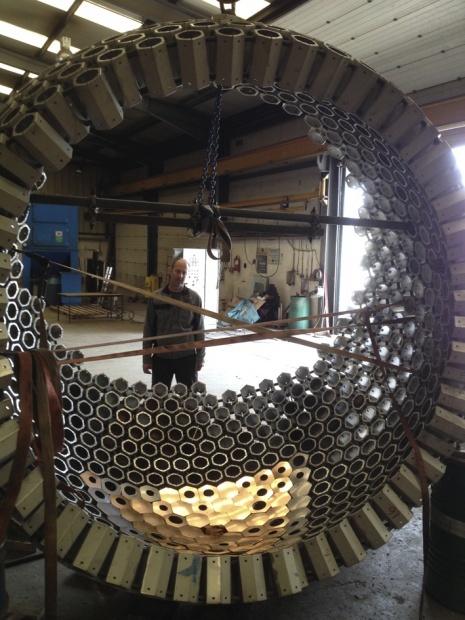 To celebrate the installation of the sculpture ‘Waggle Dance’, Illuminations presents an exhibition by Rachel Joynt and Remco de Fouw, revealing the concepts, design ideas and working practices which led to the creation of ‘Dance’. 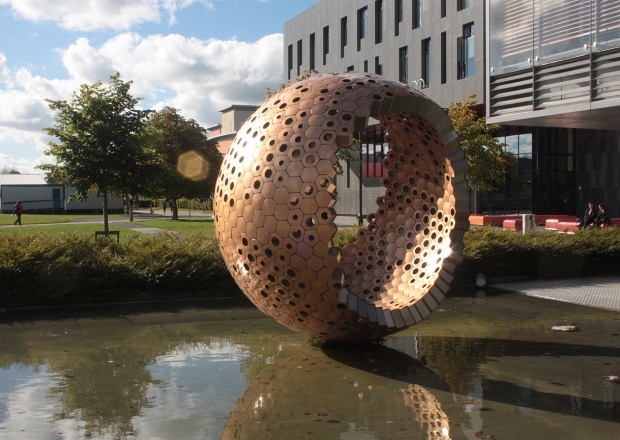 The sculpture ‘Waggle Dance’, commissioned for the plaza outside the Iontas Building, embodies the creativity, intellectual endeavour and commonality behind the activity of the university through the metaphor of the beehive. 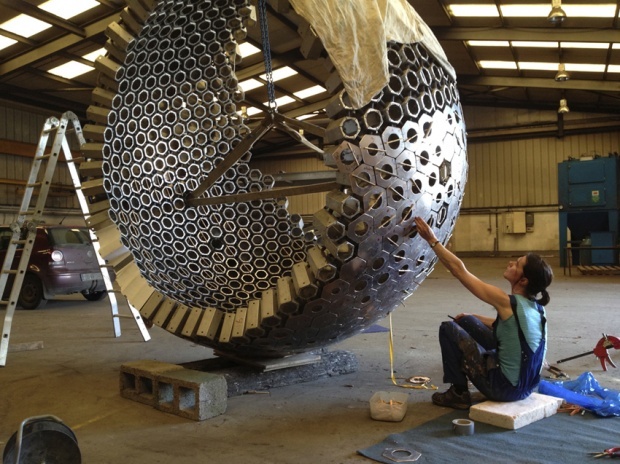 The exhibition includes a video which traverses a 3-D digital model of ‘Waggle Dance’, and images of the design, development and fabrication of the final sculpture. Also included are film interviews with Rachel Joynt and Remco de Fouw (made by students in Media Studies at Maynooth University) and a selection of individual works by Joynt and de Fouw. The exhibition is curated by Colin Graham.